My brother was recently “helping” my parents repaint the outside of their house. He got about halfway through, when my dad came outside and saw the patchy job that my dear brother had done. He grabbed a paintbrush and got to work himself (as my brother chuckled sheepishly). Sometimes, it’s nice when other people take over. This is especially true for your brand’s social media accounts. While inviting somebody to take over your Snapchat account might seem scarier than other channels, with careful planning and a clear strategy you can alleviate this fear. That said, you don’t want to blindly hand over the reins to just anyone—or for no clear reason. Continue reading to see how a Snapchat takeover can boost your social media strategy, and how to host one of your very own. Bonus: Download a free guide that reveals the steps to create custom Snapchat geofilters and lenses, plus tips on how to use them to promote your business. Reach new audiences. If your brand is being taken over by a prominent influencer who has a large following, there’s a good chance you’ll see some of their fans crossover to your channels. Increase engagement by providing unique and quality content. Build your brand through working with influencers and individuals who personify your brand values, and those of your audience. Drive web traffic by encouraging those watching your Snapchat Story to visit your website, and that of the guest host. Once you’ve established why you want to host a Snapchat takeover, it’s time to plan the big event. There are many ways to go about it, but the foundation of a great Snapchat takeover usually takes some form of the following steps. Are you just hosting a Snapchat takeover because you’ve seen other brands doing it? Think about what you want to get out of your Snapchat takeover, and why. Do you want to gain more Snapchat followers? Increase engagement? Whatever your goals are, it’s important you remember to “make sure whoever will be taking over your social media accounts is aware of your goals and what’s expected of them” so that you’re all on the same page. For some help with setting clear and achievable goals, check out our post Don’t Just Create Social Media Goals—Reach Them. Get a feel for your potential candidate’s persona by going through their social media feeds carefully. Keep any red flags (such as inappropriate, insensitive, or expletive-laden material) in mind. Consider the candidate’s social media and overall online community, and think about whether this audience aligns with your brand and goals. A celebrity takeover, where you use the massive social influence of a celebrity to bring attention to your Snapchat channel. During the recent Wireless Festival, GQ Magazine had a variety of the headlining acts conduct Snapchat takeovers to provide behind-the-scenes and insider access to the festival. An influencer takeover, where “someone who has a sizable following on social media that your target audience trusts or admires” takes over your account. As we explain, “These people have developed more direct relationships on social media than the mass followings of A-list celebrities, which means they wield influence with more specific audiences.” Wimbledon used a huge influencer/celebrity when they had Serena Williams take over their Snapchat account recently. You can check out some of her “magical” Snaps here. An employee takeover, where your employees provide behind the scenes or point of view Snaps. These are great for a Q&A format, where your audience can send questions directly to the employee and have them Snap back answers. Cisco conducted an employee Snapchat takeover in April on their WeAreCisco account, where their employees from around the globe shared what life as a member of the Cisco team entails. Once you’ve established who’s going to take over your Snapchat account, it’s time to take the next steps before the actual takeover begins. To make sure your collaboration is as successful as possible for both parties, it’s important to take some necessary steps. What each of you hope to get out of the experience. Make sure that timelines, goals, and any other key information is shared before the takeover happens. The Snapchatter’s ideas. While Snapchat’s spontaneity is part of the fun, it’s important that your guest host has a plan that they can share with you ahead of time. How you will be promoting the takeover. Both you and the Snapchatter should ensure that you are promoting the takeover ahead of time through any online channel available. It’s also a great idea to have your guest host direct their own social audience to follow your brand’s Snapchat account if they aren’t already. How you will communicate during the takeover. If you aren’t able to be in the same physical space as the guest Snapchatter, make sure that they know how to get ahold of you during the takeover. There would be nothing worse than a miscommunication caused by something that could have easily been answered or guided by you. How you will document the campaign. You’re going to want a permanent collection of the Snapchat takeover for your records, so make sure that your guest host is aware of this. Get them to take screenshots of any interactions they have and download copies of each Snap as well as the complete Story to share with you once the campaign is finished. Make sure they also take note of views and engagement for each Snap and Story. This documentation will allow you to plan for future Snapchat takeovers and social campaigns. A Snapchat takeover is a fun and engaging way to showcase your brand through a pair of fresh hands. The above guide can help alleviate the fear involved in handing over the reins to somebody else as you bring exclusive value to your viewers. Follow along with Hootsuite on Snapchat! 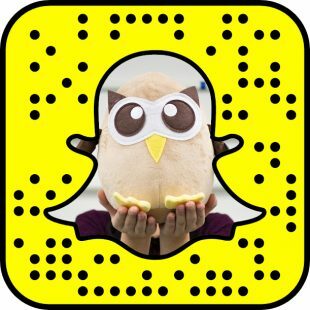 Click this link on mobile to go directly to Hootsuite’s profile or scan the Snapcode below to add Hootsuite as a Friend on Snapchat.